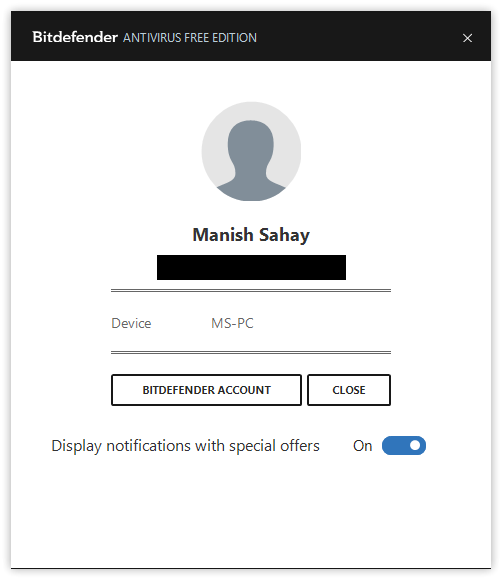 Home » PC » Antivirus & Security » Bitdefender Antivirus Free Edition 2019 Review – Fierce & Lightweight Protection for Windows 10. 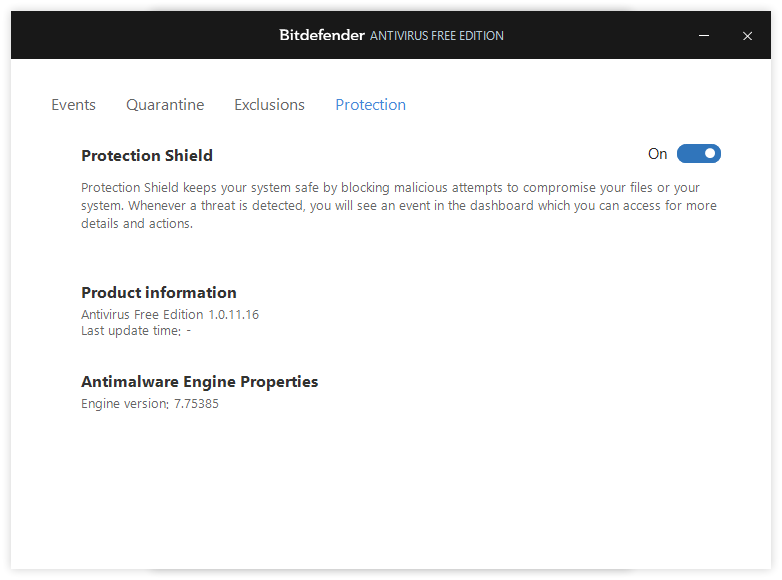 Best Free Antivirus Products for Windows PC in 2019 – Bitdefender Antivirus Free Edition. Bitdefender Antivirus Free Edition protects its users by using their famous Intelligent Antivirus engine that blocks all kinds of malware. Along with the power of signatures, you get Bitdefender’s behaviour-blocker called Active Threat Control as well. 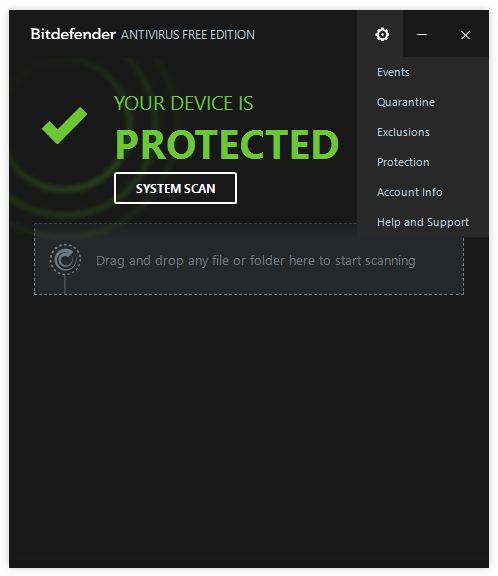 The free version also includes Bitdefender’s Advanced Threat Defense technology that uses advanced heuristic methods to protect against ransomware and other advanced threats. The web-filtering component called Safe Browsing along with Anti-Phishing & Anti-Fraud modules provides protection from harmful websites and web-based threats. You can enhance the web protection by installing the free web browser add-on/extension by Bitdefender called TrafficLight. Bitdefender TrafficLight has following features – Advanced malware filter, Protection against phishing attacks, Trackers identifier, and Link scanner. Bitdefender Photon is not available in the free version of their antivirus. Overall, it’s a great product but if you want to play with some settings then look elsewhere because you won’t find any here. Only two scan modes are available for free users. One is System Scan, which is the full computer scan. The other scan mode is kind of a custom scan. You can drag and drop the selected files or folders in the program window to start scanning. 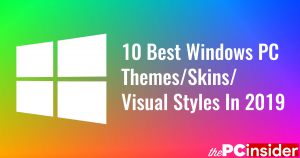 A minimalistic design and a very competent program full of award-winning technologies yet very lightweight. Virus Bulletin did not test Bitdefender in their most recent test. Bitdefender is a winner of the AV-Test Top Product award. Bitdefender is a winner of the AV-Comparatives Advanced+ award. The program is the most minimalistic in the antivirus market. Most of protection technologies by Bitdefender are present in the free version to protect you but you won’t find any advanced features here. It only has the essential features such as Quarantine, Exclusions, and Full System Scan. If you want a set it and forget it type antivirus then look no further. The Settings button in the home screen opens the doors to all of the options that this program has for you. 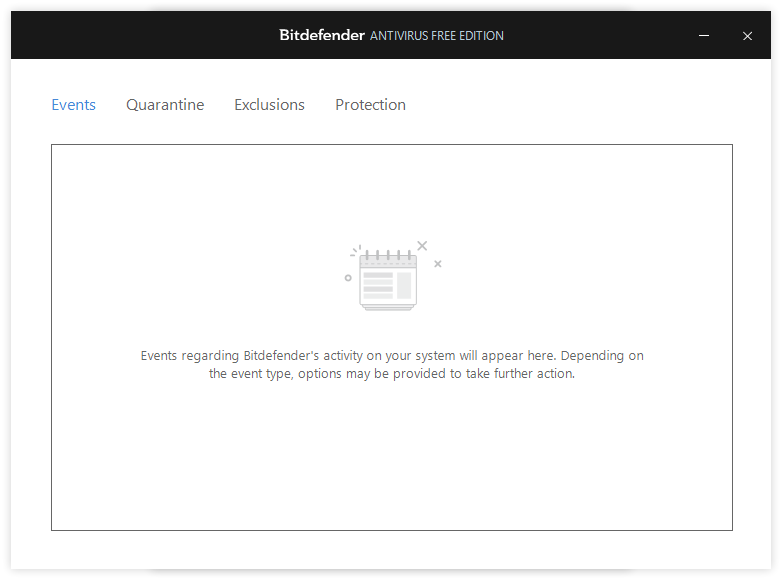 Clicking on the Events button opens the Events window of Bitdefender. It lists all of the events such as last update, last scan, last malware detection, etc. The Quarantine button opens the Quarantine window, which lists the files that Bitdefender blocked, and hence sent to the Quarantine section. You can apply various actions on the Quarantined files such as Restore, Delete, etc. Similarly, the Exclusions button opens the Exclusion tab on the Settings window. Here you can specify the files and folders that you want Bitdefender to exclude from its jobs. The Protection tab will take you the Protection window. This is an important component; as you can see, the Protection can be turned On or Off just by clicking this button. It also displays the information about the Product version and the Antimalware Engine being used in the product. Lastly, we have the Account info button, which will open the User Account Information window. Here, you can check your account credentials. You can click on the Bitdefender Account button to go to Bitdefender’s User Dashboard login page. The final item in the menu bar called Help and Support will take you online to Bitdefender’s help guide. Hard Disk Used: The installer is fairly large with more than 300 MB download from the internet. 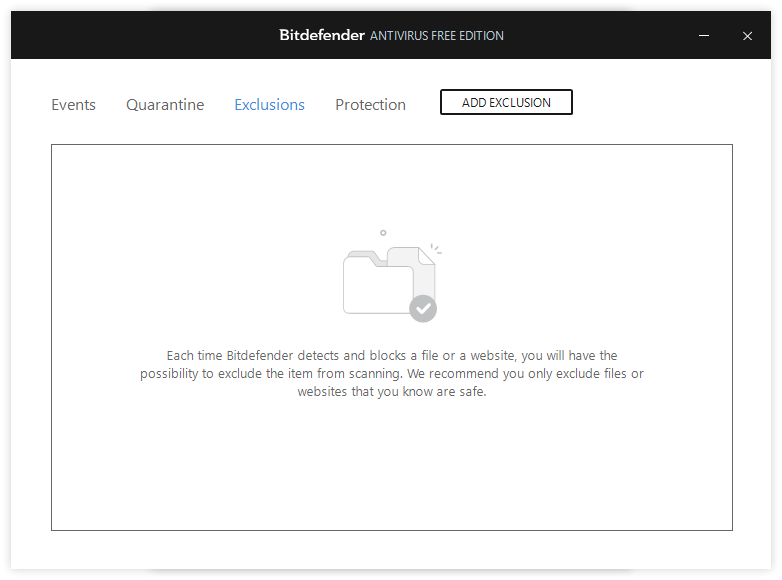 After installation and an update, the Bitdefender Antivirus Free Edition uses around 1.50 GB of the disk space. 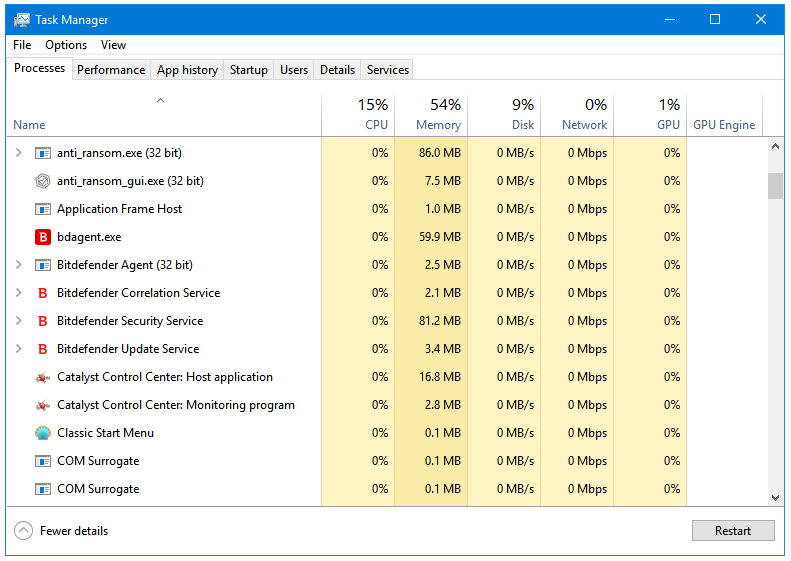 CPU and RAM Usage When Idle: Around 150 MB of RAM is used by all of Bitdefender processes and services when the program is working in the background. The CPU usage is stable at 0%. 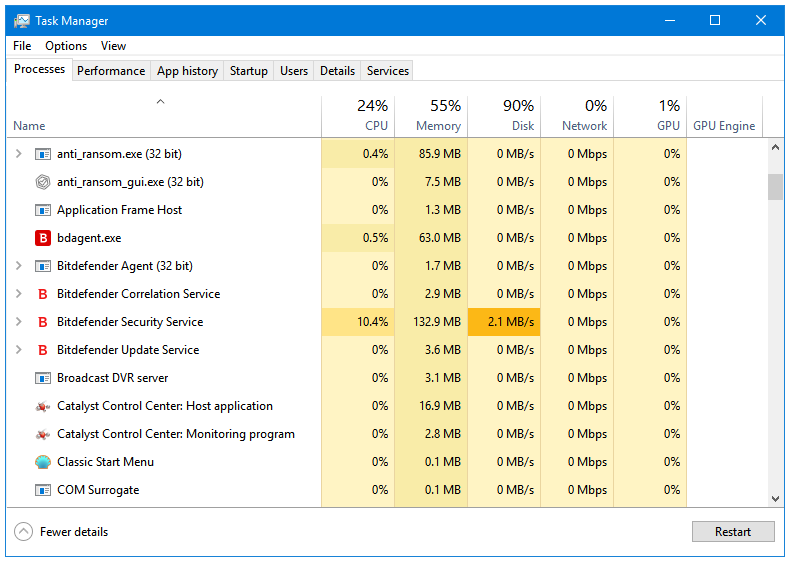 CPU and RAM Usage When Scanning: Bitdefender uses around 200 MB of RAM when it is scanning the computer for malware. The CPU usage fluctuates between 10 and 15%. 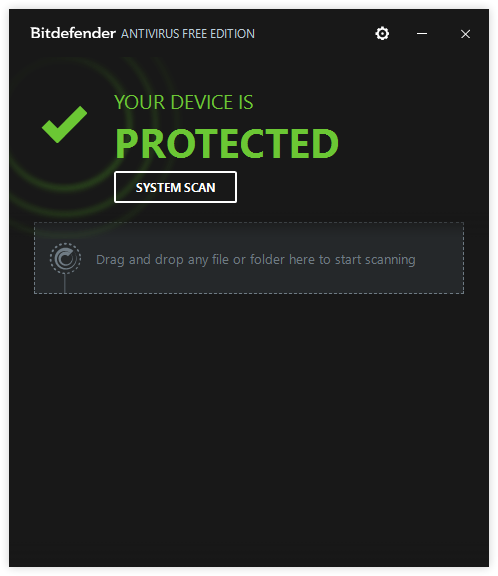 Bitdefender uses a Black coloured Flat User Interface that matches well with Windows, and modern design trends. There are no additional skins available. Everything flows well. The home page displays all of the recent events in a timeline system. All of the settings can be accessed from the Settings button, which is placed along with the Minimize and Close button in the window buttons section. The program is extremely easy to use mostly because of its minimalistic nature. None. No Ads – Neither during install nor after. There is an option called Display notification with special offers, which is On by default. Turn it Off.